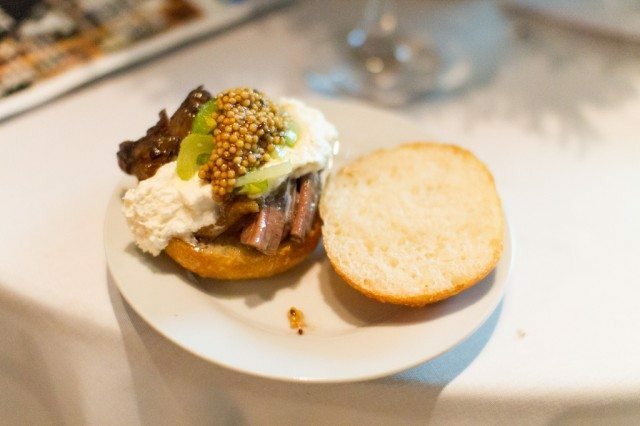 Parts and Labour's beef on weck. Victor's duck liver ice cream cones with Saskatoon berry preserve. Harbord Room's sticky carrot and ginger cake with stout cream, squash icing, and pumpkin seed brittle. George Restaurant's skewer with lemon-thyme pettole, harvest vegetables, and miso sauce. Pizzeria Libretto's pork arancini with fontina and smoked scamorza fonduta. GwaiLo's pastrami spring rolls with kimchi-pickled green tomatoes and Chinese-mustard aioli. What’s On The Table, as the fundraiser is known, is now in its eighth year. Wednesday’s edition sported an all-star lineup of the best culinary talent in Toronto, and a live auction whose proceeds went to fund a program that provides warm drop-in meals to those in need. The Stop runs many programs aimed at ensuring food in Toronto is accessible, healthy, and never in short supply for people of all walks of life. At Wychwood Barns, the organization operates a state-of-the-art greenhouse at that grows over 4,000 pounds of produce a year (including oranges, lemons, and grapefruit), as well as a commercial kitchen. Chef Chris Brown is one of the driving forces behind The Stop. He rounded up friends from kitchens around the city to join him for What’s on the Table. For the most part, their recipes honoured The Stop’s commitment to local food. Wine from Niagara vineyards flowed, and representatives from Steamwhistle Brewery talked about how their employer uses Canadian green glass, employs a local glassblower to help recycle bottles into art, and relies on deep-lake cooling from Lake Ontario to reduce its electricity bills. Between bites of her lemon-thyme pettole and harvest vegetable skewer from George Restaurant, attendee Sarah Crawford said she loves supporting The Stop—especially considering the fact that she can eat while she does so. She and her husband both volunteer with the organization as a baker and a cook, respectively. Without a doubt, some of the best bites of the evening were vegetarian. George’s vegetable skewer won over Torontoist’s heart. Meanwhile, Cafe Belong, of the Evergreen Brickworks, put together a pickled pumpkin “steamroller” that was an utter delight. The chestnut soup shooters from Jamie Kennedy Kitchens had a smooth, comforting texture that matched the autumnal weather outside. The item that seemed to be creating the most excitement was GwaiLo‘s pastrami spring roll, served up with kimchi-pickled tomatoes from Chef Nick Liu’s garden, and Chinese-mustard aioli. The densely packed meat in a tight crisp wrapper hit every note as its juices dribbled down chins. There were plenty of other daring creations on display as well, like Beast Restaurant’s Ontario water buffalo manti—a type of Turkish dumpling smeared in a light, creamy sauce with an appealing garlicky aroma. And then there were Nadège Patisserie‘s Camembert macarons, which were a mouthful in the best way possible. Soma‘s salted caramel hot chocolate, with toffee powder, gingerbread, and pecan chips was also a show stealer. For many who attended the event, the only thing better than leaving with a belly full of warm food was knowing that, thanks to the money raised, others will have full bellies too. CORRECTION: November 8, 2012, 3:35 PM This post originally said, incorrectly, that What’s On the Table had raised $46,000 for The Stop. In fact, the amount was $270,000. CORRECTION: November 9, 2012, 12:11 PM The third image in the photo gallery was incorrectly labelled as Cafe Belong’s pumpkin steamroller. The photo actually shows Sidecar’s smoked beef cheek terrine.